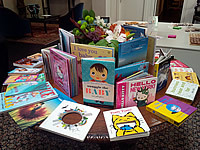 August 2018 - On August 25th, board member, Shar Levine, threw a small fundraiser for Books For Me! Bands played, dogs howled and guests opened their hearts and wallets to sponsor one of our locations. In addition to heaps of smoked brisket and smoked chicken, guests dined on fabulous platters of bao, rice noodle salads and quinoa dishes generously donated by BAO DOWN at UBC. Although Shar says this is the last of her big parties, we know she will be doing this again next year. 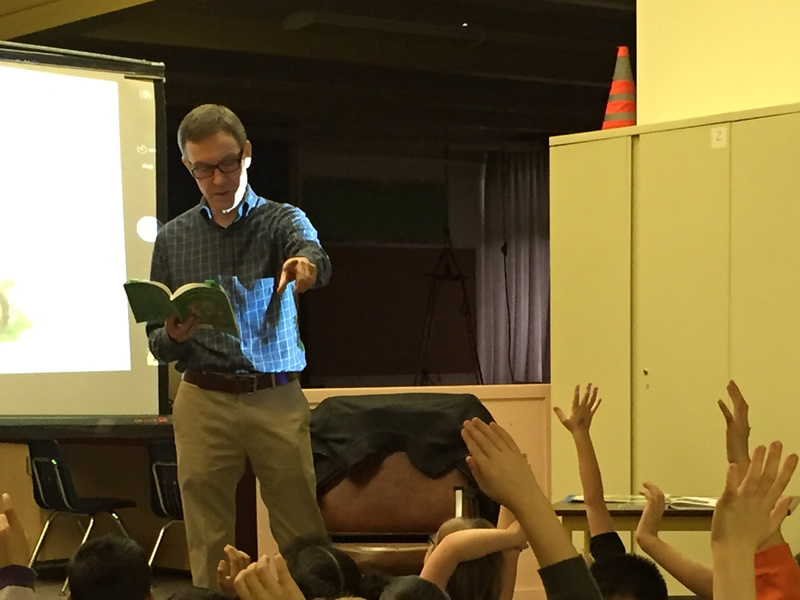 How many free books have been chosen by Vancouver-area children in Books for Me! programs since October 2011??? In 2017 Books for Me! received "The 2017 Corporate Good Neighbours Award" from the Association of Neighbourhood Houses BC. In 2017 SCHOLASTIC donated $1000 worth of new books to Books for Me! January 2017 - Students from Summit Middle School. 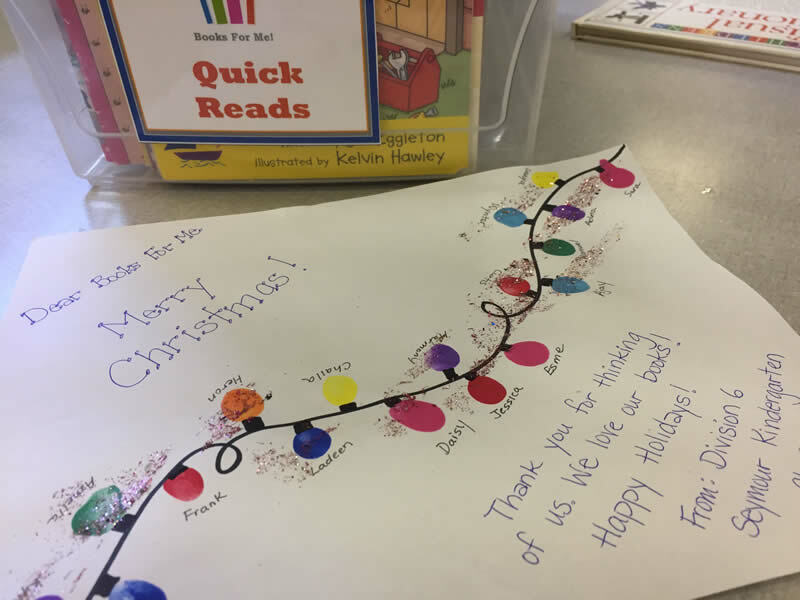 December 2016 - Thank you card from the Kindergarten class at Admiral Seymour Elementary. Feb 2016 - Duane Lawrence read excerpts from his books, Sammy Squirrel and Rodney Raccoon to the Grade1/2 students at Tillicum Annex on Valentine's day. 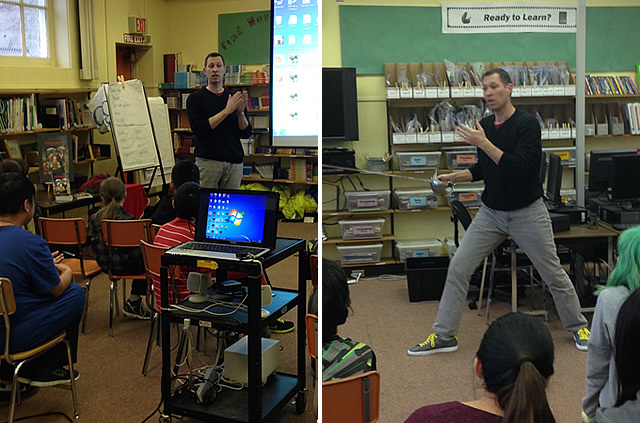 The kids were very engaged, asked many questions about the stories and about the writing process. Thanks for an exciting presentation!! See more about Duane and his books at www.duanelawrence.ca. 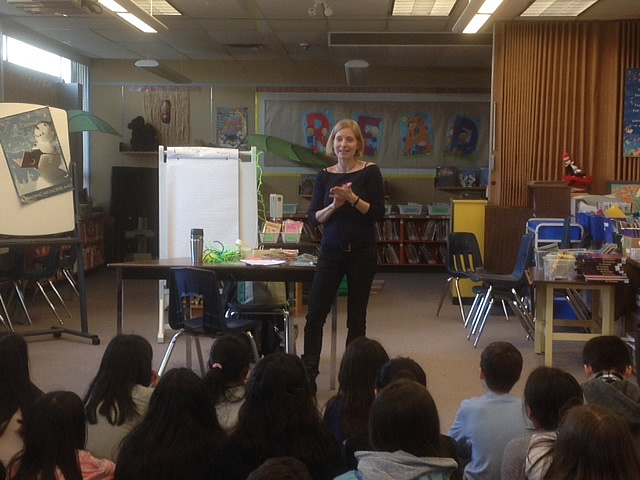 Feb 2016 - Author Tanya Kyi visited intermediate students at Graham Bruce Elementary. She shared her passion for storytelling, amazing people who have followed their passion (to the extreme) and the incredible impacts of DNA research on our society. Wow! A very inspiring presentation! Students role played the power of DNA analysis at a crime scene. 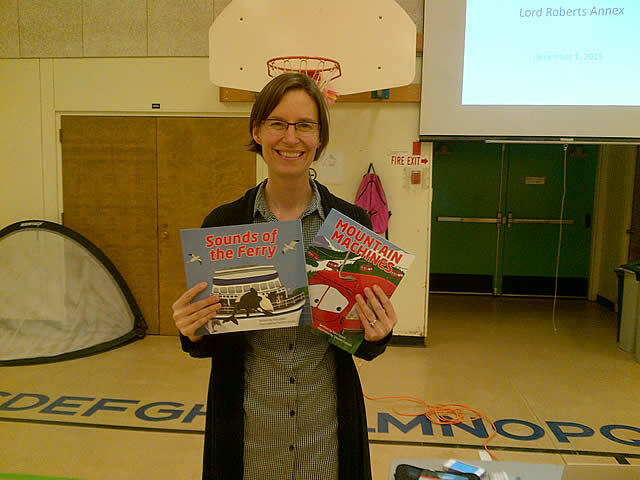 Dec 2015 - Children's author, Sara Leach, gave a wonderful presentation at Lord Roberts Annex in December 2015. 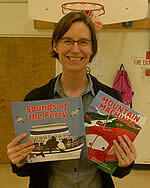 Sara read from two of her books, Sounds of the Ferry and Mountain Machines. The sound effects were lots of fun and, as one can imagine, encouraged a high level of participation by the children. Sara also explained to the children how she came up with the ideas for the books and what was involved in getting an initial concept to a finished book. Thank you Sara for an inspiring presentation! Marianne loved teaching children to read! So according to her adult children Heidi Parks (Hayward, California) and Robin Howard (New Westminster, B.C.) 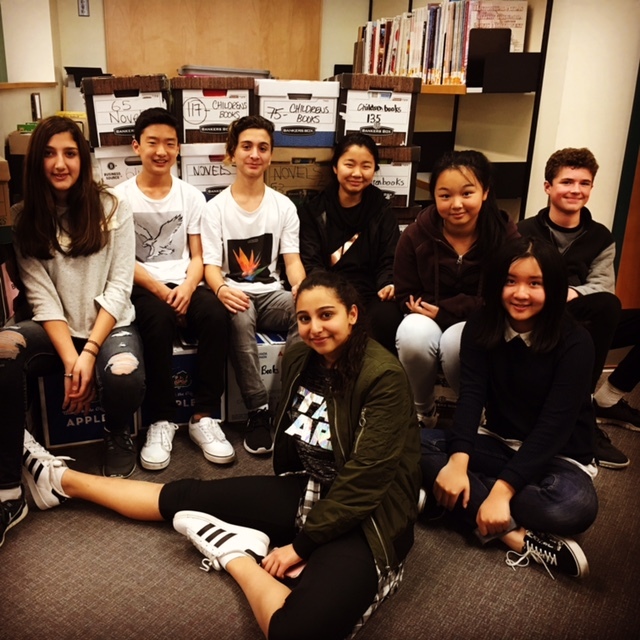 holding a book drive for Books for Me! in her honor when she passed away recently was a natural thing to do. Marianne was a grade two teacher in the Burnaby School District for 17 years and she continued to tutor many years into retirement. Teaching children to read was her passion – especially if they were struggling with school. 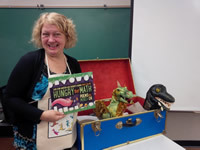 She passed away in Vancouver at age 92 on May 5, 2015, and as part of her Celebration of Life on June 14, 2015, family and friends attending collected children’s books. A friend of the family, Margaret Buttner, who works for the Vancouver Public Library Foundation, recommended Books for Me! Marianne’s family reports they were impressed with how the program puts books into the hands of the children who need them most and how the program is run entirely with volunteer efforts. Marianne’s family says the more they learned about Books for Me!, the more they knew the book drive idea would be Marianne-approved. 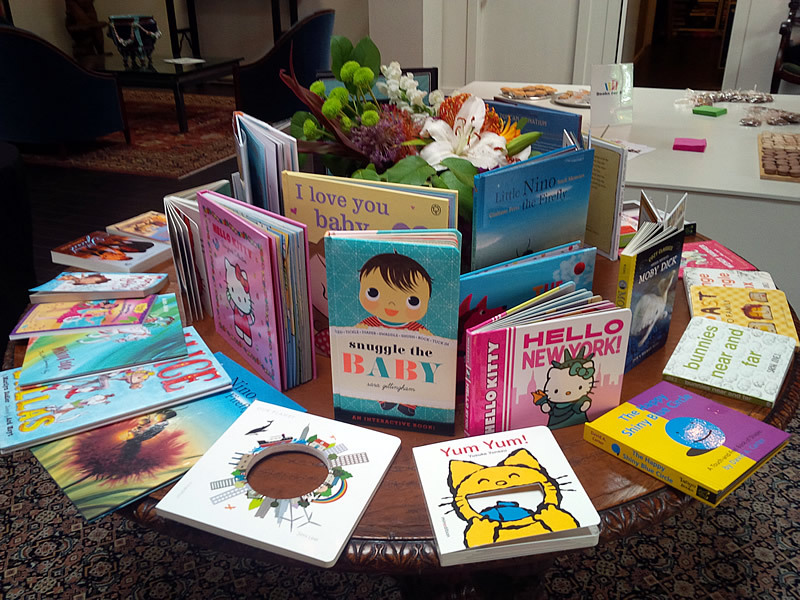 The attendees at the Celebration of Life brought armloads of lovely children’s books. The family says their only regret is that Marianne did not know about Books for Me! before her passing – because it would have made her happy to know about a group doing such wonderful work helping children to read. June 2015 - Who knew science could be so much fun and interesting at the same time? 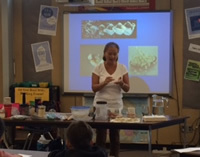 Shar Levine -aka Science Lady dazzled the students at Admiral Seymour with her hands-on science demonstrations including how to move a walnut from one end of a closed container filled with rice to the other end of the container without opening the jar. The children were amazed to learn how static electricity could pick up pepper while leaving salt on a plate and that a balloon could be inflated while still having the mouth of the balloon wide open. We won't spoil the tricks by telling you how she did it. You'll just have to read her books to find out the science behind the magic. While there may or may not be a future NHL star in the audience, both boys and girls alike learned the science behind their favourite game of hockey. Thank you Shar for donating this presentation! June 2015 - Nothing in the world captures the attention of 11 year old boys more than telling them about a snake that farts. Once you've said that, you've got them engaged in science. 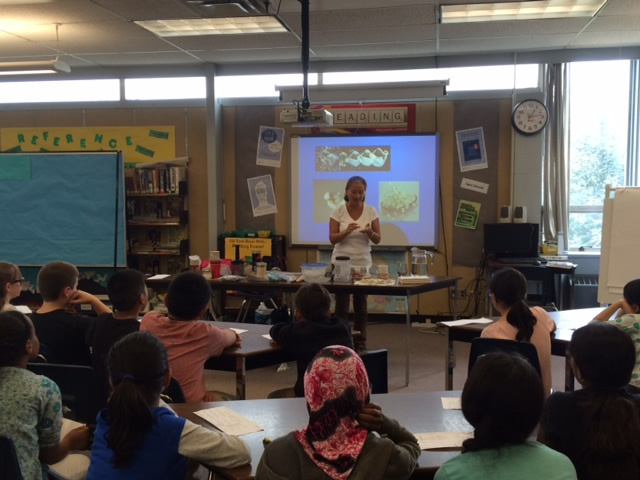 Shar Levine or science lady, spent the afternoon with the wonderful students at Graham Bruce Elementary. She explained how to grow popcorn and gave the school enough germinated popcorn seeds to start their own crop at the school. Each student was also given a take home experiment – a piece of paper that when folded showed how the wings on an airplane worked. 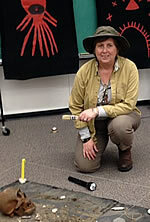 Levine had the children roaring with laughter when she showed 3-D electron images of a bug's private parts. The demonstrations from her book on Hockey Science resulted in a visit from the principal who wondered why there was so much noise coming from the library. All in all it was a fun presentation that still has the students talking. Thanks Shar for donating this presentation. 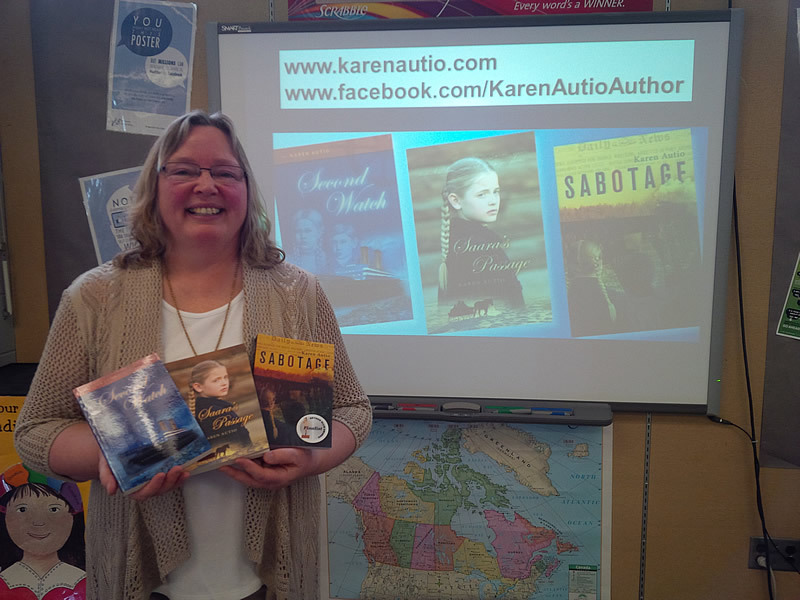 May 2015 - Award winning author Karen Autio paid a visit to Graham Bruce Elementary in May, and read aloud from her book "Sabotage"...the children were entranced by the suspenseful story, and couldn't wait to read what happens next. Karen also talked about her Finnish heritage, growing up in Ontario, and how her family stories started her on the path to writing three different historical fiction books about Canadian children. She shared a copy of the first book she ever wrote (at age 9!) 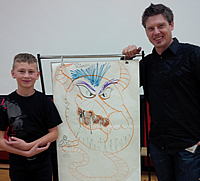 which surely inspired some of the budding writers in the audience! 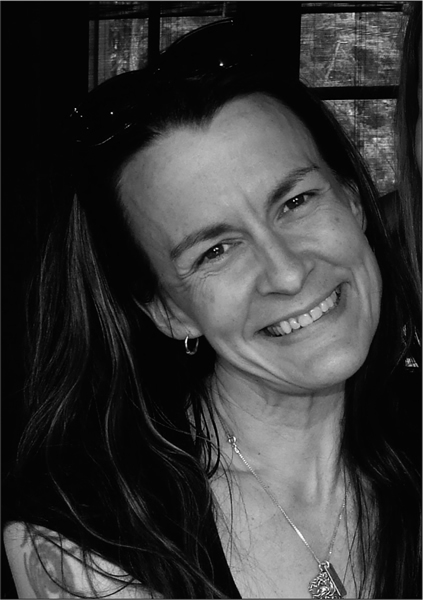 Her next book, called "Kah Lan", features the adventures of Sea Otters, told from the animals' perspective. 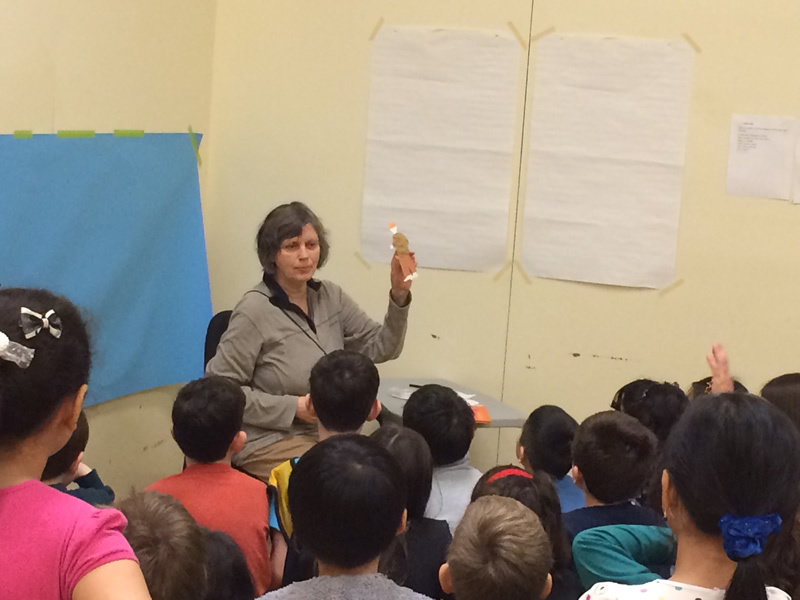 March 2015 - The squeals of laughter and excitement could be heard down the halls of Lord Roberts Annex as CWILL BC member, Elizabeth Shefrin showed the students how to create artwork for a book. 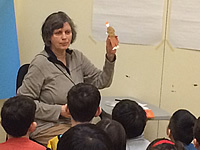 The noted illustrator read from Abby's Birds, then led a workshop for the class. The resulting mural for their school featured cut-out images of the children and balloon captions. 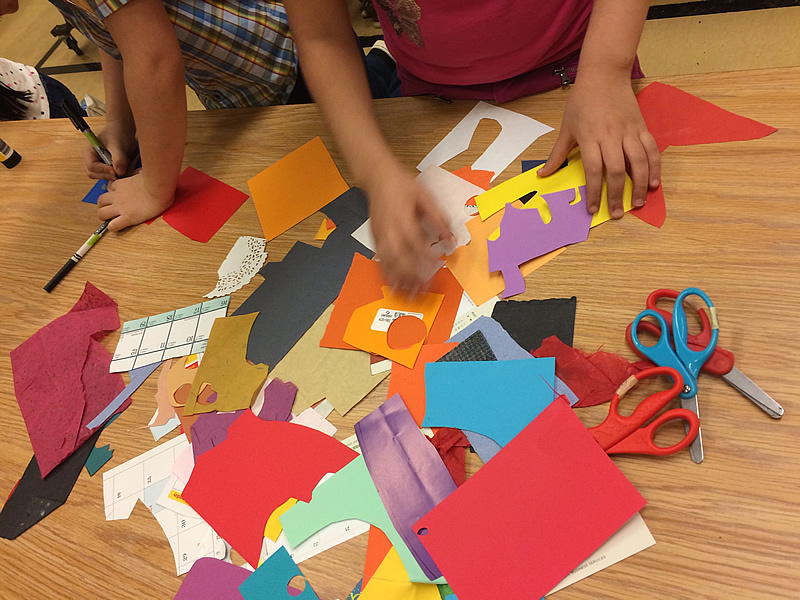 Teachers happily grabbed scissors, glue and pens to design their own images. Books for Me! Was thrilled to sponsor this presentation and would like to thank Elizabeth for her participation in this program. January 2015 - Ainslie Manson visited Admiral Seymour Elementary and read her new book, A Giraffe Called Geranium and Just Like New, to Grade 2 and 3 students. It was fantastic! Ainslie also explained some of the ways that she came up with the ideas for her various (13) books, one idea came from her imagination, one was from a trip she took to Africa and one was based on something that happened in her childhood during WWII. 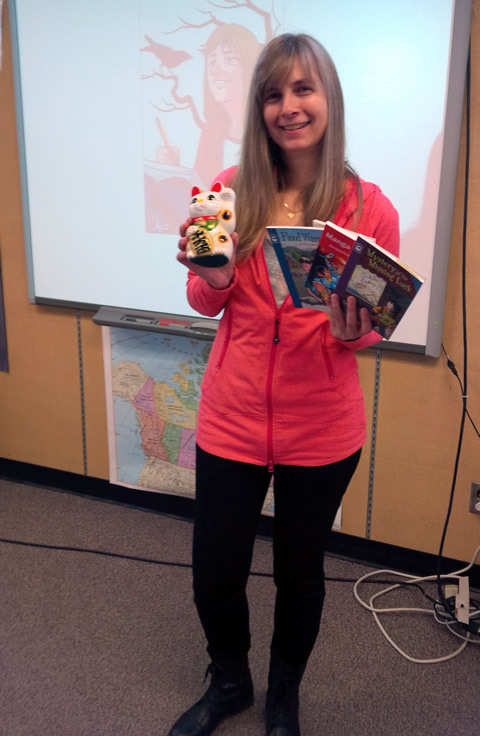 December 2014 - Dianna Bonder received a warm welcome from three classes at Tillicum Annex School. The kids were excited to hear about all the animals that live with her and her children on Gabriola Island. 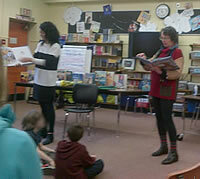 As both an author and an illustrator Dianna shared how some of her ideas and sketches get turned into books. She described the process of illustrating a book while drawing some great pictures that the kids got to take back to their classrooms. The kids thought it was really cool seeing Dianna's sketches and watercolours turned into the pages of a book. May 2014 - On May 22, 2014 Books for Me! 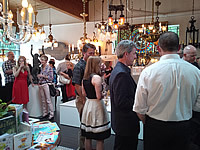 held a very successful fundraising Event at the beautiful Renew Period Lighting and Decorative Arts Gallery. 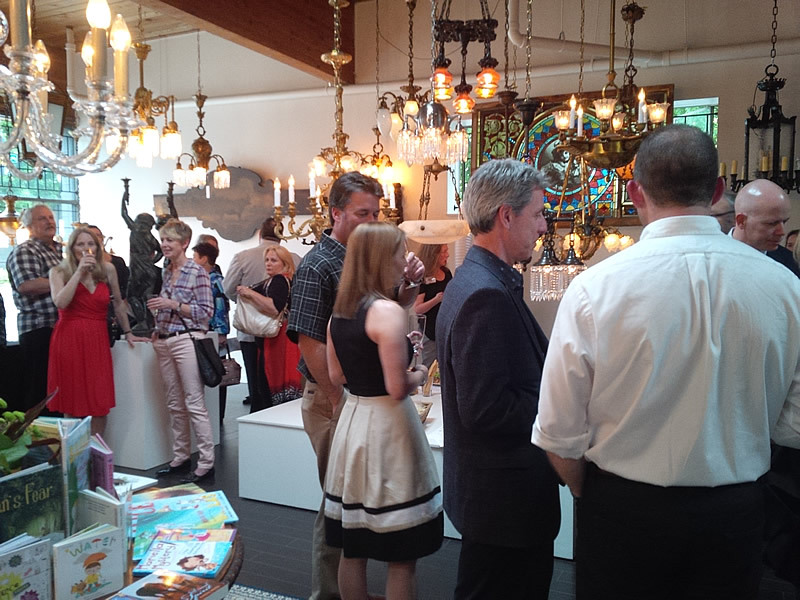 Thank you to all of the many, many people and organizations that supported the "Shine a Light on Books" Event! You have made it possible for us to continue our work this fall. 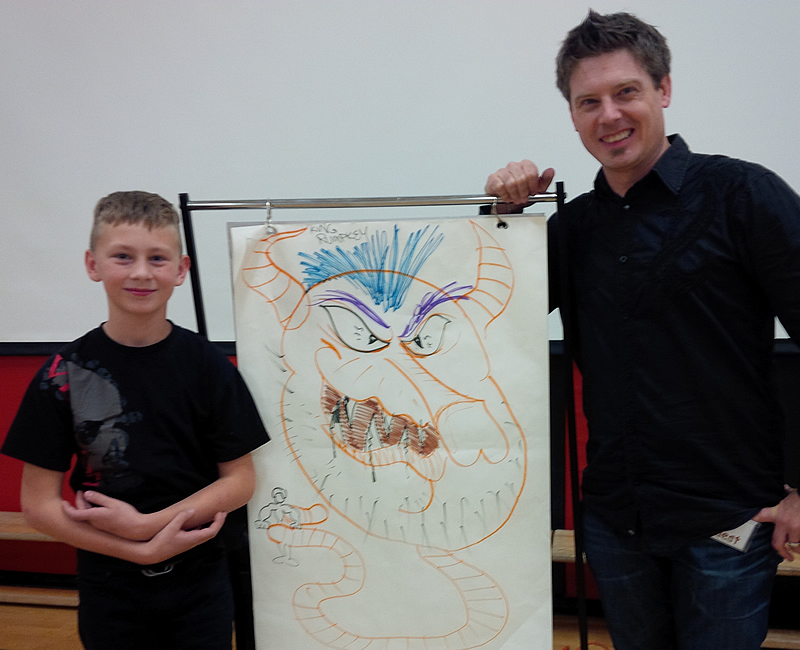 April 2014 - Students from Graham Bruce Elementary gathered in their school library in April to hear award-winning author Jacqueline Pearce talk about how she comes up with her book ideas, how she researches them and how they evolve from start to finish. She told the students about traveling to Japan to find out about Manga for "Manga Touch" and about taking care of some pet rats when she was writing "The Truth about Rats (and Dogs)" The children were very interested to hear about ‎her adventures as an author, and asked some excellent questions. 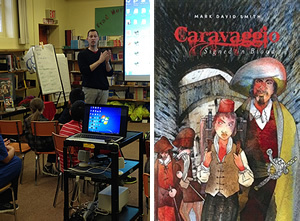 They were also excited to hear about her next book, coming out this Fall, set during the War of 1812! 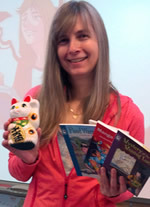 February 2014 - In February, students at Henderson Annex were greeted unusually by children's author Gina McMurchy-Barber. They entered a darkened room where music was playing and incense was burning. There were replicas of Native wall art and a roped off archeological "dig" site on the floor which included a skull! 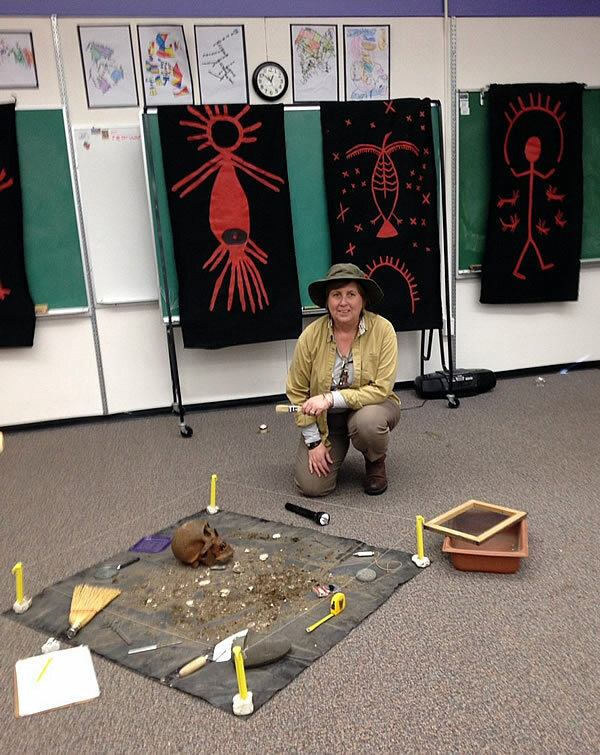 The kids were throughly engaged while Gina shared her knowledge of history and archeology. 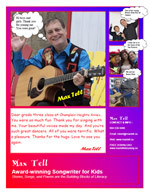 February 2014 - In February children's author and award winning song writer, Max Tell, gave a wonderful presentation at Collingwood Neighbourhood School. Everyone had an amazing time! Max Tell sent a great thank you poster to the staff and students at C.N. School after the presentation that we want to share with you. 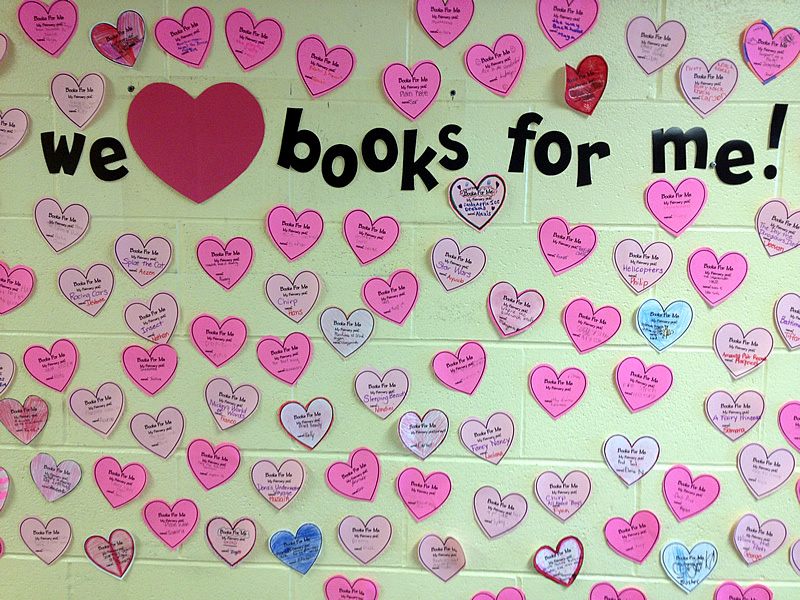 February 2014 - The students at Graham Bruce made a lovely Thank You Poster for Books for Me! 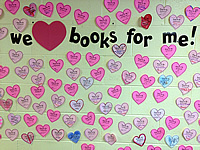 Each student put their name and the name of the book they choose on a heart to make this beautiful thank you collage.